New Hampshire towns have been served by Town Clerks since the early towns were first established. Before, 1699 clerks were appointed by judiciary, since the nineteenth century, Towns began to choose Town Clerks by ballot. Most of the duties of a Town Clerk are established by State Statute. Town Clerks record all votes passed by the Town during the annual Town Meeting and elections as well as all responsibilities involved in primary, state and national elections. Any person who has his domicile in Columbia and whose name is not already on the checklist may apply to the Town Clerk or the Supervisors of the Checklist to have his name added. For more information, please see the Voter Registration Section below. The issuance of motor vehicle registrations are a major portion of a Town Clerk's day. In addition to collecting the town portion, I also am a Municipal Agent for the State of New Hampshire, which means that I can issue plates and decals and process title applications. For more information, please see the Motor Vehicle Section below. Each dog over four months old must be registered by its owners or keeper prior to April 30th of each year. For more information, please see the Dog License Section below. Notary Services are available at the Town Office during normal business hours. Please have a valid photo identification available. There is no charge for this service. Documents requiring notarization must be signed in the presence of the Notary Public. Any document signed where the signature is not done in the presence of the Notary Public, will not be notarized. Certified copies of New Hampshire Vital Records can be obtained from any New Hampshire Town Clerk for documents issued during the following years: Birth Certificates – 1985 to present; Death Certificates – 1990 to present; Marriage Certificates – 1990 to present and Divorce Records – 1990 to within 6 months of current date. Certified Copies for events prior to these dates must be obtained directly from the New Hampshire Town Clerk where the event occurred or for marriages, the Town where the original license was obtained. For more information, please see the Vital Records Section below. 1. Be a resident – a resident is someone who has a domicile in the Town on a continuing basis for a significant portion of the year. A person can have only one domicile for the purposes of voting. Voter Registration Form – Information that must be provided includes name, address (mailing and physical), place and date of birth. Filing out the voter registration form and signing it involves a solemn oath that the information is true. Documents needed include: proof of identity (driver's license, etc. ); proof of citizenship (birth certificate, naturalization papers, etc. ), proof of age and domicile. Party Affiliation – You are not required to list a party affiliation in New Hampshire. Listing oneself as undeclared means that you have no party preference. There is no “independent” party in New Hampshire. In primary elections, an undeclared voter may request either party's ballot at the polls and will be listed on the checklist in the future as a member. A voter who wishes to return to “undeclared” status after voting may do so after voting. Change of party affiliation (changing from one party to another) may be done no sooner than the day after an election. Rights – If the qualifications are met and the Supervisors of the Checklist add an applicant to the checklist, that person has the right to vote at any meeting or election held within the Town. Where to Register – Individuals may register to vote during normal office hours at the Town Office. There are special registration session held on certain dates by the Supervisors of the Checklist. These dates are posted on the door of the Town Office and in the local newspaper. Residents may also register to vote at the Polls on Election Days. Where to Vote – All elections in the Town of Columbia are held at the Columbia Town Hall at 1919 US Route 3, Columbia. Polls are open from 11:00 to 7:00 for State and National Elections and from 11:00 to 6:00 for Town Elections. The annual Town Meeting is held on the second Tuesday in March at 7:15 pm at the Columbia Town Hall. Absentee Ballots - If you are unable to vote in person, you may request an absentee ballot from the Town Clerk's office during normal business hours. I have just moved to Columbia from another Town in New Hampshire. Do I need to change my address on my registration and drivers' license? You will need to provide proof of residency here in Columbia (rent receipt, lease agreement, electricity bill, etc.). State of New Hampshire Change of Address forms are available here at the Town Office. If I move out of New Hampshire prior to my registration expiring, do I receive a refund? No, neither the Town nor State provides a refund if you move. I just purchased a new car, what do I need to bring with me? 1. If you purchased a car from a New Hampshire dealership, you will need to bring the blue title application marked “Town Clerk's Copy” on the bottom. 2. If you purchased the car from out of state you will need to bring either the certificate of origin or original title with you. 3. If you purchased the car from a private seller, you will need to bring the original title which has been correctly assigned to you on the back by the seller. c) a State of New Hampshire Form TDMV19A (verification of VIN number) which is filled out by a NH Inspection Station, a NH law enforcement officer or a NH car dealer. How do I transfer plates from my old car to a new car? You will need to bring with you the current NEW HAMPSHIRE unexpired registration and the Town Clerk's copy of the Blue Title Application or the Title from the dealer or seller of the new vehicle. License plates are owned solely by the FIRST PERSON listed on the registration and can only be transferred to a registration that again reflects the same person as the first owner on the registration. If it is a leased vehicle, you can transfer your plates as long as the lessee is the same as the owner of the plates. What do I need to obtain a New Hampshire Driver's License? 1. An original or certified copy of your birth certificate or passport. These documents must be in your current name. If not, then documentation indicating your name change must be presented. 2. A current valid out-of-state driver's license. Can I get any plate type at the Town Office? 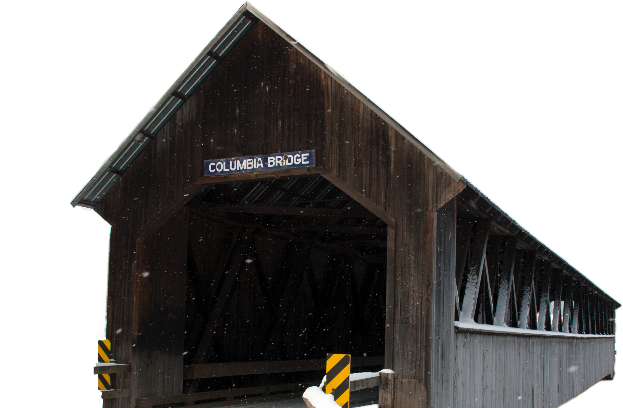 The Town of Columbia can issue: regular passenger plates, Moose plates, vanity plates/initial plates, motorcycle plates, trailer plates, vanity antique plates, vanity motorcycle plates, vanity trailer plates, vanity Moose plates, agricultural plates, Farm plates, and Tractor plates. All other plates types can be obtained through the State of New Hampshire DMV Offices. Can I renew all of my registrations here? Most renewals can be processed at the Columbia Town Office with the exception of vehicles weighing more that 25,000 pounds. The Town of Columbia accepts cash and personal checks. If you are paying by check and plan to do both the Town and State portion of your registration, you will need to have two separate checks. If a personal check is returned for non-payment by our bank, an additional $25.00 returned check fee will be assessed. What do I do if I lost my title? I you have lost your title and the vehicle is newer than 15 years old, you will need to apply for a duplicate title. This can be done at the Town Office during normal business hours. There is a $25.00 fee payable to the State of New Hampshire. Can I register a car with my child's name on it? In New Hampshire, the youngest a person can be listed on a registration is 16 years of age. Until the child turns 18 years old, a Parental Consent form needs to be filled out during any new registration or renewal. I have just moved to Town from another state, what do I need to bring with me to register my vehicles? 2. Current out-of-state registration and ORIGINAL title. If you do not own the vehicle (still have a loan on it), you will need the full name of your lien holder along with their address. 4. If two people are listed on the title, they will both need to be present to fill out the paperwork. Under State Law, each dog over four months old must be licensed by it owner or keeper prior to April 30th of each year. The license is effective from May lst to April 30th. Proof of rabies vaccination must be presented at the time of licensing. Any person who has five or more dogs, may apply for a group license. Verification of rabies vaccination must be presented for each dog. In addition, there is a $1.00 per month late fee if not paid before June 1st. It is the responsibility of the Town Clerk to give the Board of Selectmen a list of those owners who have failed to license their dogs by June 20th. The Board of Selectmen can issue a civil forfeiture in the amount of $25.00 for each unlicensed dog. If the forfeiture is not paid, then a summons to Court may be issued. A couple wishing to get married in the State of New Hampshire may apply for their marriage license in any Town Clerk's Office in the State. They must provide proof of identification and age (both parties must be at least 18 years). If either of the people have been previously married, this person must provide a certified copy of a divorce/annulment decree, a death certificate or civil union dissolution. You may apply for a marriage license during normal business hours. Your license is valid for 90 days and both parties must appear in person together. There is no requirement for a blood test. The charge for a marriage license is $45.00. After the marriage occurs, the officiant completes the license and returns it to the Town Office where you applied for it. The couple many obtain a certified copy of the marriage certificate for a $15.00 charge. A request must contain the signature of the person requesting the record. If requesting the copy by mail, you must include a valid, legible photocopy of a photo ID (i.e., driver's license, passport, etc.) If you do not have a photo id, please call the Town Clerk for assistance. Various older records are exempt from access restrictions. Birth records older than 100 years and death, marriages and divorce records older than 50 years are available without restrictions. You can access these records through the Town Clerk where the original event was recorded or through the Bureau of Vital Records Genealogy Center at 71 South Fruit Street, Concord, NH. The center is open to the public from 8:30 to 11:45 and 12:15 to 4:00 Monday through Friday. There are volunteers available to assist you.